Profile: Kup, as in Pickup Truck, is an old warhorse. A grizzled Autobot veteran with ten thousand tall tales from his one thousand adventures and a motto or word of advice for any situation. He is as brave as they come and as loyal, and sometimes as crotchety as a wet hen - especially when Hot Rod's adolescent thoughtlessness propels them into dangerous areas. Kup loves the Dinobots because they love hearing his tales of glory. When he transforms, Kup's vehicular mode is somewhat squarish and "old-fashioned" compared to some of the sleeker, "later model" Autobots, but he has no complaint about that. He sees himself as a seasoned campaigner with much knowledge to impart and he imparts it whether or not anyone has asked for it. He is sort of the Falstaff to Hot Rod's Prince Hal and he likes the role. 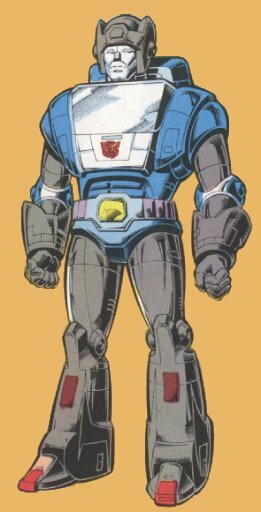 Abilities: In robot mode, he carries an old-style musket laser that shoots bursts of metal-corrosive hydrochloric acid. Range: 5 miles. Speed: 100 mph.